Built on Microsoft's powerful .NET Framework, C# and Visual Basic are complete equals in terms of coding power and application development possibilities. In today's multi-platform environment, an understanding of both languages is a job requirement. The C#-Visual Basic Bilingual Dictionary unifies the languages by providing clear, functional equivalents for all syntax and grammar differences. Complete coverage of all language keywords. Nearly 900 dictionary-like entries cover every Visual Basic and C# keyword and grammar feature, including VB's "My" namespace. Full support for Roslyn. 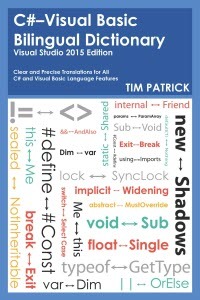 Each chapter covers the latest language features from Visual Studio 2015 and Microsoft's "Roslyn" compiler. Whether you work on a team that uses both languages, or just need to understand a technical article written in that "other" language, the C#-Visual Basic Bilingual Dictionary is an essential resource for developers crafting Microsoft software solutions. In time for the release of Visual Studio 2015, you can now purchase this essential resource, in paperback or ebook format. Buy the ebook edition from Amazon Kindle, Apple iBooks, Barnes & Noble, Kobo, Inktera, or ebook.de (in German).